Dr. Shaheryar Siddiqui earned his medical degree at one of Pakistan’s premier medical schools, Dow Medical College in Karachi. Afterward, he spent a year completing an internship at Civil Hospital Karachi. He went on to pursue research in Gastroenterology at the Aga Khan Hospital before coming to the United States for further training. He completed his internal medicine residency at The Englewood Hospital and Medical Center as part of the Mount Sinai School of Medicine internal medicine residency program in Englewood, New Jersey, where he also served as Chief Resident. From there, he became a clinical instructor in Hepatology at the McGovern Medical School at UTHealth and then joined the program to complete his fellowship in gastroenterology and Nutrition. Dr. Siddiqui is board certified by the American Board of Internal Medicine. He is a gastroenterologist treating adult patients ages 18 and up. He specializes in treating irritable bowel syndrome, inflammatory bowel disease [Crohn’s and Ulcerative colitis], celiac disease, motility disorders, chronic constipation, diarrhea, bloating and gas, chronic liver problems, cirrhosis, Hepatitis B and C. In addition, he offers general endoscopic procedures and general gastrointestinal care, including preventative screenings for colon cancer. He is fluent in multiple languages, including English, Hindi and Urdu. Throughout his career, Dr. Siddiqui has published multiple articles in peer reviewed journals and is also the author of chapters in Andreoli and Carpenter’s Cecil Essentials of Medicine. He is a member of the American College of Physicians, the American Medical Association, and the American College of Gastroenterology. In his spare time, he enjoys playing tennis, swimming and volunteering. 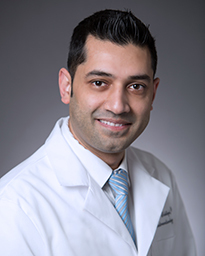 Dr. Siddiqui practices at Memorial Hermann Medical Group Southwest GI.